Lying off the north-western coast of the European mainland, the United Kingdom includes the island of Great Britain, the north-eastern part of the island of Ireland and many smaller islands. The United Kingdom is surrounded by the Atlantic Ocean, with the North Sea to its east, the English Channel to its south and the Celtic Sea to its south-south-west, giving it the 12th longest coastline in the world. 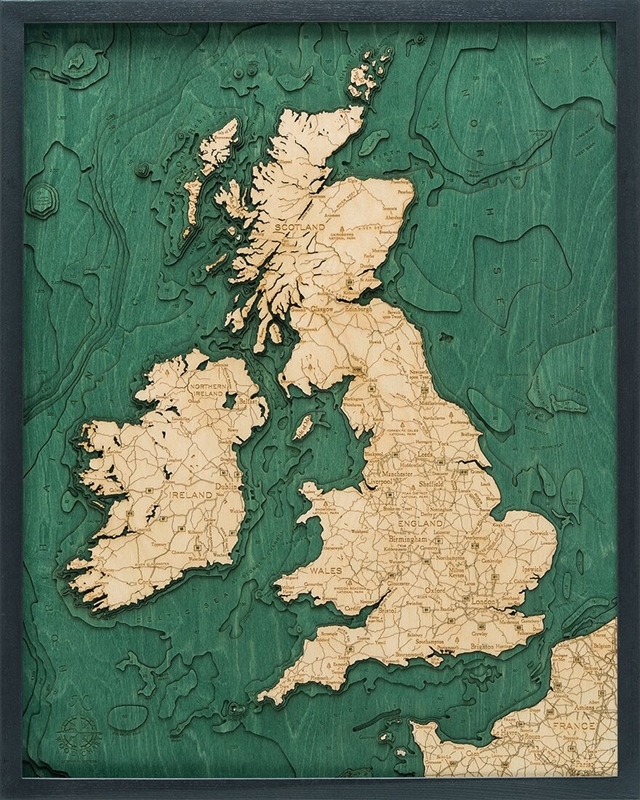 When you’re searching for unique gift ideas for the aquatic lover in your life, look no further than a United Kingdom nautical wood map. Our laser cut charts are framed, crystal-clear acrylic covered, 3D bathymetric charts carved in Baltic Birch wood. These maps depict the shoreline and bottom contours of The United Kingdom, and they show precise shorelines, depths, landmarks and lettering. Special finishing techniques bring out the natural grain of the Baltic Birch. Show off your love of the United Kingdom. 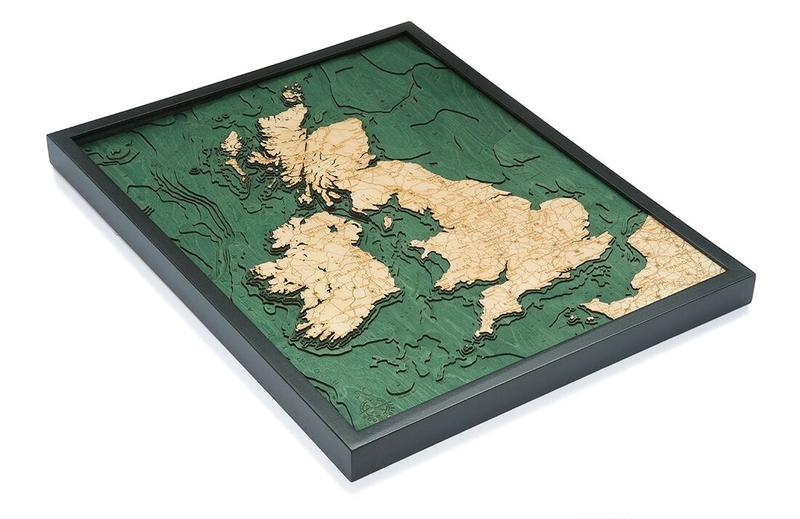 This laser engraved wood topographical map offers a unique and beautiful way to display the places you love with a framed piece of wall art. 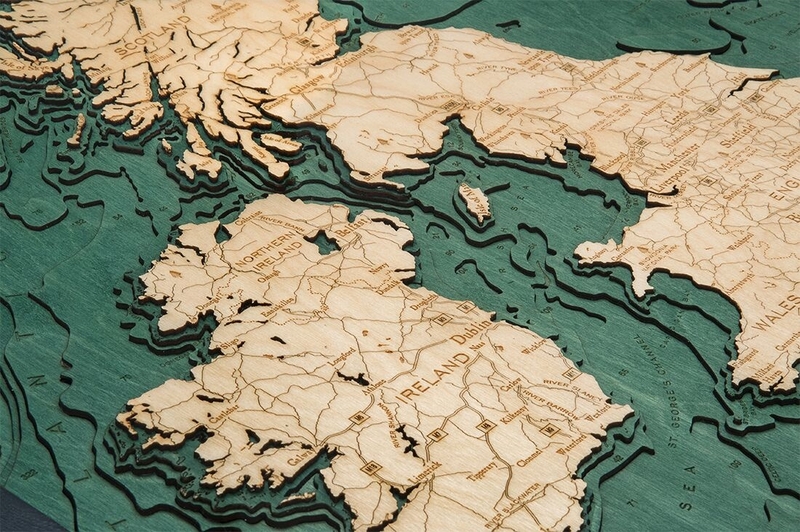 For the most detailed and lowest priced United Kingdom nautical charts on the market, look no further than Carved Lake Art. Order your solid-wood framed and ready-to-hang bathymetric wood chart today, or contact us if you have questions! Carved Lake Art is here to help. Check out this map of Ireland only.